As the sun sets, enjoy stunning 360 degree views, a relaxing environment, and great "Sundowner" drink specials at The Octave Rooftop Lounge and Bar. 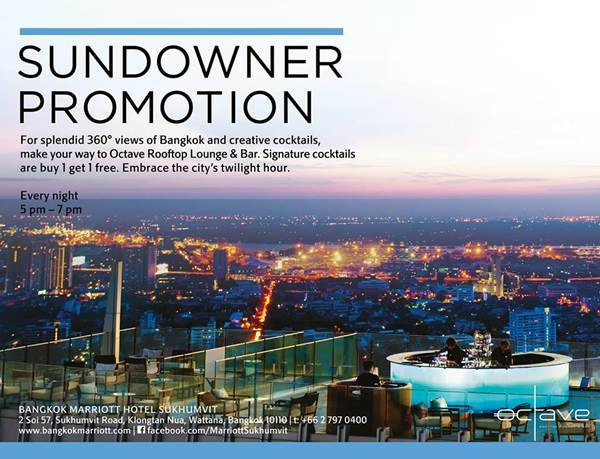 The Sundowners promotion is for those who seek out a laid-back ambience for after-work drinks and enjoy the sunset with a 360° view of Bangkok. The refreshing signature cocktails promise to chill you out after a dull day of work. From 5-7 pm buy one glass of the Sundowner signature cocktails and get another of equal or lesser value for free on the 49th floor. Octave brings the sounds, the sky, and the city to life on the 45th floor of the Marriott Bangkok Hotel on Sukhumvit Soi 57. The multi-zone outlet features a restaurant, private dining room, bar and rooftop lounge. Offering a contemporary design inspired by New York apartment terraces, they also feature resident DJs on weekdays and special acts on weekends. Music is an essential factor of the lounge experience here. Featuring modern fusion food like Asian-style tapas platters and a seafood bar along with the finest in wines and cocktails, Octave is effortlessly the hippest destination in town!